Butterfly bush (Buddleja) is a shrubby perennial, prized for its showy panicles of purple, rose or white flowers. Most gardeners grow Buddleja davidii, which is native to China. Evergreen in warm-winter areas, it can die back to the ground when temperatures drop below 20 degrees Fahrenheit. In spring, the plants rebound vigorously and bloom the same season. Butterfly bush can grow to 10 feet or more, but dwarf hybrids allow those with smaller gardens to enjoy the fragrant blooms--and the butterflies and hummingbirds they attract. Many Buddleja davidii plants, such as "black knight," feature rapid and open growth, but the variety "nanohensis" grows to only about 5 feet and spreads as wide. Cultivars such as "nanho purple" have smaller leaves and thinner stems than other varieties of buddleja davidii. Flower panicles are also smaller, but more numerous. Enthusiasts embrace the variety for its more graceful habit and lacy open growth. Buddleja davidii "summer beauty" features compact growth to about 4 feet and intense-pink blooms. It has pale silvery leaves that brighten moonlit gardens. "White ball" butterfly bush has bright white flowers and grows only 3 feet high. All the varieties need average moisture and full sun to partial shade. Elizabeth Keep from England introduced new cultivars of Buddleja davidii that reliably stay 3 feet and under. Despite the small size of the plants, the "English Butterfly series" have large and showy flowers. They are also prolific bloomers. The newest introductions feature a denser growth habit than older, compact davidii varieties. "Peacock" has large purplish-pink flower panicles. "Purple emperor" features deep and saturated purple blooms. "Adonis blue" introduces rare blue color in the garden. 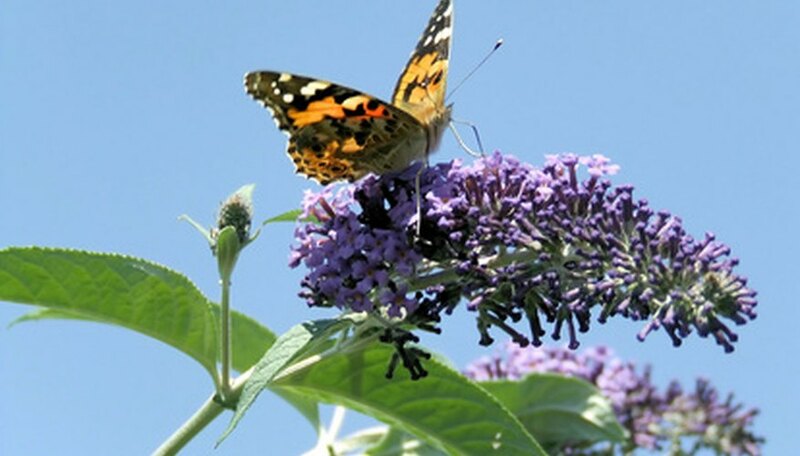 Some hybrids other than the davidii butterfly bushes offer lower growth and fragrant and plentiful blooms. Butterfly Bush "Lindley" (Buddleja lindleyana) has deep-green small leaves and light purple blooms. It grows to about 4 feet high and has fountain-like growth. Lindley can spread by suckers under ideal conditions, and might become invasive. Butterfly bush "bicolor" (Buddleia weyeriana) has a slow growth habit and needs protection where winter temperatures drop below 20 degrees Fahrenheit. "Bicolor" has both pink and gold flowers mixed together, creating a showy and novel display.